We repair Achilles tendon ruptures without an open surgery. Over the past 20 years, we have optimized a technique allowing us to avoid making an open incision and preserve the growth factors to speed healing and decrease infection. The Achilles is a dense band of tissue that passes behind the ankle joint. It is the thickest and strongest tendon in the body and is about 6 inches long. The Achilles tendon can receive a load stress 3.9 times body weight during walking and 7.7 times body weight while running. Injuries to the Achilles tendon vary from mild to severe: tendonitis, a partial rupture, or complete rupture. 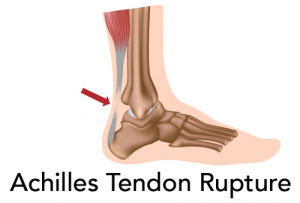 Achilles tendon ruptures most commonly occur in middle-aged men, often while playing basketball or tennis. People will usually report feeling a "shot" in the back of the calf and then having sharp pain. This injury is debilitating and can cause immense pain. A palpable defect at the complete rupture. A lateral x-ray of the heel, essential for determining whether or not there is calcification or avulsion of the Achilles insertion on the calcaneus. An MRI, extremely helpful in determining the status of the tendon, the degree of inflammation, and whether or not a partial tear is present. "We repair Achilles tendon ruptures without an open surgery. Over the past 20 years, we have optimized a technique allowing us to avoid making an open incision and preserve the growth factors to speed healing and decrease infection. Our technique is called Percutaneous Achilles Repair and works by passing sutures through the skin and pulling the ruptured ends of the tendon together allowing the tendon to heal back to its normal strength." In the setting of tendonitis or partial rupture, a treatment of platelet-rich-plasma (PRP) combined with use of a heel lift, soft tissue massage, and a careful physical therapy program can sometimes lead to complete healing without surgical intervention. Platelet-rich-plasma (PRP) is processed by drawing the patient’s own blood, spinning the blood to concentrate the platelets and growth factors, and then injecting the PRP into the site of injury. The growth factors stimulate the cells of Achilles tendon to produce new collagen and effect repair. One-to-three injections may be required. We never inject cortisone into the Achilles tendon for any inflammation or injury as cortisone may lead to rupture of the Achilles tendon itself. If the Achilles is completely ruptured, we prefer to not open the ruptured site. 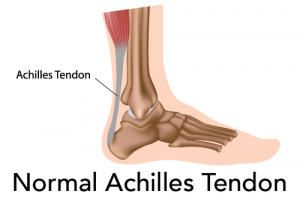 This is because when an Achilles tendon ruptures, the body attempts to create a healing environment and, as bleeding occurs within the sheath around the Achilles tendon, it brings new cells to the injury site and starts the repair process. If you open the site, the natural healing factors are then lost into the surgical incision. Open surgery also leads to increased scarring and increased risk of infection. The alternative to open surgical repair of the ruptured Achilles tendon is a percutaneous repair of the ruptured tissue. This is accomplished by making a small skin nick and passing sutures in a crisscross fashion, capturing the proximal and distal aspects of the tendon and cinching them together. This closed technique permits preservation of the natural growth factors and blood clot that forms around the ruptured ends and facilitates healing with less scarring. Our results of percutaneous Achilles tendon repair have been superb with only 6 traumatic re-ruptures in twenty years of repairs. The tendon sheath, holding the blood clot that forms at the time of the tendon rupture is kept intact, permitting rapid healing of the tendon. The proximal portion of the tendon, as identified by palpation and MRI, is captured with a #1 Tevdek suture placed transversely through the skin and the tendon and out the opposite side. This suture is then crisscrossed through the tendon, the gap at the rupture site, and finally through the distal portion of the tendon just above the calcaneus, through the skin punctures. A second stitch is placed after the first one and is tied with the foot in plantar flexion. A dressing is applied and the foot is placed in a plantar flexed pre-formed padded splint. 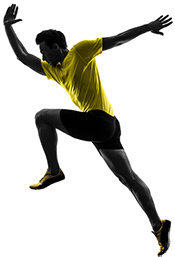 A comprehensive physical therapy program is essential to encourage full healing and return to competitive sports. (Pool at six weeks, golf at three months, bicycling at three months, and tennis at six months). Please refer to our detailed rehabilitation protocol.